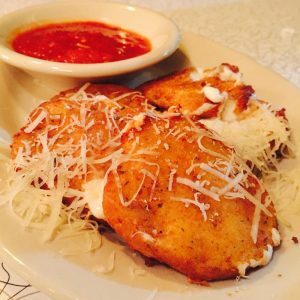 ***** DISH OF THE WEEK (Sunday-12/9/18- Howley’s Restaurant). Trust Jeff Eats on this one, this joint is off the chart good! Whether it’s -Breakfast, Lunch or Dinner- absolute dynamite! ***** Howley’s Restaurant, 4700 South Dixie Highway, West Palm Beach, Florida 33405, (561) 833-5691. Got something really terrific for you guys…Howley’s …for our purposes let’s call Howley’s a diner. Last night after dropping Son Jeff Eats off at Palm Beach International Airport- the combination of 2 wrong left turns followed by 3 wrong right turns and a fight with Mrs. Jeff Eats over my not being able to follow her instructions-we ended up right in front of Howley’s Restaurant. The joint looked exactly the same as when I first told you guys about it way back on June 17, 2008…making lemonade out of lemons-the crab-cakes that Mrs. Jeff Eats had and my bacon cheeseburger & French fries were delicious. Howley’s is open Sunday-Thursday 7am-2am, Friday-Saturday 8am-5am. By the way, that June 17, 2008 write-up printed is down below. 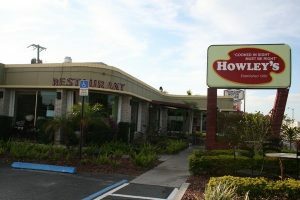 One of my favorite South Florida joints to eat breakfast, lunch and dinner at is Howley’s Restaurant which is on Dixie Highway in West Palm Beach. This joint has been around since 1950…and is basically an old fashioned diner. 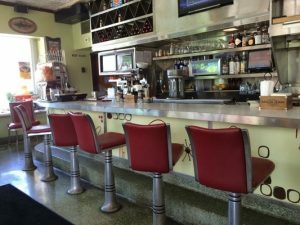 Other than a flat screen tv here and there, you’ll swear that you are in a diner circa 1950. This joint doesn’t play the Johnny Rocket’s game. The decor is the real McCoy. Howley’s does “everything.” Breakfast-lunch-dinner…In addition to a counter, there is booth and table seating. There is also an outdoor dining patio. Just so you know, the guy who owns the famous Dada Restaurant located in Delray Beach bought Howley’s about 3 years ago…soooo the food is absolutely top-notch. This joint makes crab-cakes, the likes of which you have never tasted before. Over the past few years, I probably have eaten in this joint 20 times. I absolutely love the atmosphere, the food and the hip-youngsters that comprise the wait-staff (no they don’t wear 1950’s costumes). Howley’s prices are “all over the place.” There are all kinds of bargain specials, but some of the dishes are pretty pricey. Like I said before, this is a diner whose short-order-cooks were replaced by top-notch chefs. This is a great place. If you look closely, you will see that Howley’s is right next door to a NO TELL MOTEL circa 1950. I sure wish Howley’s walls could talk. Howley’s is open 7 days a week for breakfast, lunch and dinner. As for the crowd…tee shirts/shorts…tuxedos…suits…bikers…you name it. Great place. Don’t miss it. Coincidentally my wife and I ate dinner there last Saturday night. You made an absolutely tremendous call on this one. Terrific food and service. The joint also is very cool looking with both indoor and outdoor patio seating. The crab cakes and bacon cheese burger we had were delicious. Been eating there for over 15 years.